Let Us Cook You Breakfast! Save-the-Date for our 4th Annual "Pancakes for Ponies" Breakfast Fundraiser Sunday morning, May 5th, at the St. Charles Moose Lodge. It's also the same weekend as the Kane County Flea Market! Stop by for breakfast between 8:00- Noon, then walk next door to do some antiquing! Breakfast tickets on sale NOW or purchase at the door. It's going to be a fun morning with a delicious homemade breakfast including pancakes hot off the griddle, savory sausage, scrambled eggs, fresh fruit, coffee, juice and milk. Come learn about our rescue and meet some of our rescue ponies in person! We’ll also have loads of great Raffle Baskets with tickets drawn every hour, “pick a pony” game, glorious Petunia Baskets for Petunia Donkey, a gorgeous Quilt Raffle w/ Casey’s Safe Haven, Casey’s swag for sale, 50/50 Raffle (need not be present to win) and so much more! Proceeds of this event will go to support the rescued equine of Casey's Safe Haven Holistic Horse Rescue and Sanctuary. Winner takes half the pot! AT LEAST $1,000 GUARANTEED! Need Not Be Present To Win. 50/50 Raffle Tickets Will Be Sold at the Event as Well. 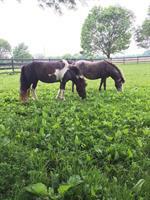 Come see what rescuing Ponies, Horses and Donkeys is all about! See before and after photos and meet one of our sweet RESCUE PONIES!